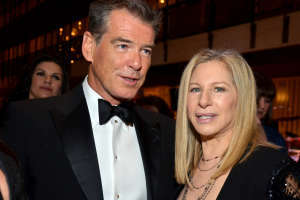 Barbra And Pierce Bronson. . Wallpaper and background images in the Barbra Streisand club. This Barbra Streisand photo might contain traje de passeio and terno de negócio.